New Orleans may see six to 12 inches of rain, and is gearing up to be one of the worse blows to hit the city since Katrina. Weather Channel meteorologist Jim Cantore reports. Updated at 2 a.m. ET: Unprotected, low-lying areas outside New Orleans were evacuated Monday as Tropical Storm Isaac grew closer to becoming a hurricane that could make landfall in or near Louisiana almost seven years to the day after Hurricane Katrina struck. "All preparations to protect life and property should be completed tonight," said Ed Rappaport of the National Hurricane Center in his 8 p.m. ET Monday update. He emphasized that water from rain and storm surge would be the biggest threat -- 6 to 18 inches of rain are expected. Isaac's wind speed increased to 70 mph, just 4 mph short of a hurricane, the National Hurricane Center said in a late afternoon update. It also forecast Isaac would reach Category 2 status with 100 mph winds late Tuesday night. That's a stronger Isaac than was forecast earlier Monday. By 2 a.m. ET Tuesday, the center of the storm was 145 miles southeast of the mouth of the Mississippi River with maximum sustained winds still at 70mph, the National Hurricane Center said. Isaac was predicted to slow down upon landfall, which forecasters say could be the ultimate test of $14 billion upgrade to its levees and pumps. In areas near New Orleans, mandatory evacuations were ordered Monday morning for "our low-lying areas — those outside the hurricane protection system — such as Lafitte, Crown Point, Barataria and Grand Isle," Jefferson Parish President John Young told TODAY. Plaquemines Parish, which stretches 60 miles out into the Gulf, also issued a mandatory evacuation order for its 7,000 residents on its east bank starting at noon Monday. "We’re telling them to get out," Parish President Bill Nungesser told MSNBC. "We’re going to get hit first and we’re going to take the worst beating of this storm. So people are heading up the highway now." "In our parish there’s one road in and one road out," he added, "and it’s steady traffic flowing out the parish as we speak." Isaac is expected to be the first major test of a $14 billion makeover of the system that failed the city so disastrously in 2005. NBC's Lester Holt reports. Parts of Lafourche, St. Charles, St. John parishes saw mandatory evacuations as well. The governors of Alabama, Louisiana and Mississippi declared states of emergency as a hurricane warning went into effect for a 300-mile swath that extended into Florida. The warning area was later narrowed to between Morgan City, La., and the Alabama-Florida border. President Barack Obama approved Louisiana's request for federal disaster declaration, Governor Bobby Jindal said. The approval makes federal funds available for disaster recovery activities like clearing debris, Reuters reported. "Tonight is when the conditions will start to go downhill" ahead of landfall by Tuesday night, National Hurricane Center Director Rick Knabb said in a morning update. Isaac will probably move slowly inland, possibly dumping as much as 18 inches of rain in places, Knabb said. "That's going to be the big problem," NBC meteorologist Al Roker said on TODAY. "We're talking about potentially 24 hours of hurricane force winds and heavy rain." "Storm surge is going to be a big, big problem," he added. "Six to twelve feet above normal as you get to New Orleans. Panama City is about four to seven feet." The hurricane warning area includes New Orleans, which was devastated when Hurricane Katrina swept over the city on August 29, 2005, killing more than 1,800 people and causing billions of dollars of damage along the coast. A hurricane hasn't hit the Gulf Coast since Ike in 2008. New Orleans Mayor Mitch Landrieu said at a briefing Monday that schools and City Hall had closed and that the city's defense network of levees and pumps was ready. NBC's Lester Holt reports from New Orleans, La., where residents and visitors are prepping for Tropical Storm Isaac as it threatens to strengthen into a hurricane before landfall. "All pumps are operational," he said. "We are well prepared to go." Landrieu earlier noted the irony of Isaac's arrival. "The timing, as fate would have it, on the anniversary of Katrina has everybody in a state of alertness, but that is a good thing," he said. If Isaac makes landfall a bit west of New Orleans, that puts the city in the northeast quadrant of the storm, Roker noted, "and that's the worst place" for storm impact. With tropical storm force winds that extend 205 miles from its center, Isaac is an unusually wide storm. "Impacts will be far to the east and to the west of where it comes ashore," Craig Fugate, head of the Federal Emergency Management Agency, told TODAY. TODAY's Savannah Guthrie talks to Jefferson Parish president John Young about possible impact of Tropical Storm Isaac on Louisiana, how residents should prepare and when voluntary evacuations will become mandatory. Robert Latham, the director of Mississippi's emergency management agency, urged residents to prepare for the storm's possible arrival. "This is important to remember, this is a huge storm," he said. "I don't have to tell you what a storm like that can do." Alabama Gov. Robert Bentley ordered mandatory evacuations beginning on Monday for residents in low-lying areas along the coast. Oil companies earlier evacuated workers and cut production at Gulf offshore rigs. Weather.com reported that areas as far west as extreme southeast Texas should continue to monitor Isaac's progress in case a farther west track materializes. Tropical Storm Isaac rakes the Dominican Republic, Haiti and Cuba as begins to bear down on Florida, where Tampa will be hosting the Republican National Convention. Some Gulf residents started stocking up on supplies and securing their homes. In New Orleans, long lines formed at some gas stations and in Gulfport, Miss., people crowded supermarkets to buy bottled water and canned food. 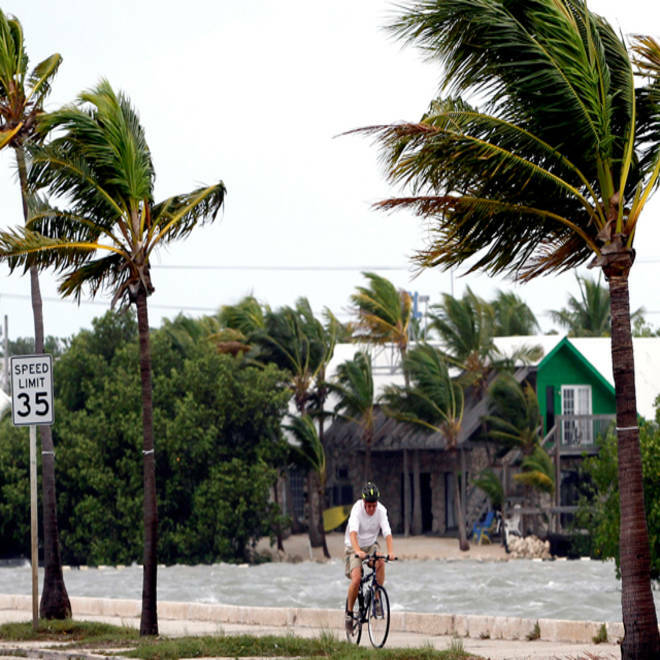 On Sunday, the storm lashed the Florida Keys and Miami area with wind and rain. Monday morning, some 80,000 south Florida homes and businesses were without electricity due to downed trees that fell on power lines. The hurricane warning area includes "quite a few oil rigs," said National Hurricane Center meteorologist Jessica Schauer, but perhaps not the heart of the U.S. offshore oil patch, which produces about 23 percent of U.S. oil output and 7 percent of its natural gas. That could send gasoline prices spiking just ahead of the Labor Day holiday, analysts told Reuters. "It's going right in the heart of refinery row," Phil Flynn, an analyst with Price Futures Group in Chicago, said Sunday. Isaac's westward track meant the worst of its weather missed Tampa, where the Republican National Convention was to open its four-day meeting on Monday — but official events were delayed until Tuesday because of the storm. Tampa and much of Florida's west coast and panhandle saw bands of heavy rain on Tuesday morning. "There's an isolated tornado threat in central Florida up through the northeastern Gulf area," Knabb said. "Just because the center is out in the Gulf don't think that in Florida there aren't some hazards." Several Republican governors from Gulf states have altered their plans for the GOP convention. Alabama's Gov. Bentley and Louisiana's Gov. Jindal canceled their trips to Tampa. Florida Gov. Rick Scott gave up a chance to speak. NBC's Chuck Todd reports from Tampa, Fla., where delays at the Republican National Convention due to Tropical Storm Isaac are set to disrupt the lead-up to Mitt Romney's acceptance of the Republican nomination for president. U.S. grain elevators on the Gulf coast were shut and barges carrying grain and other goods on the lower Mississippi River were halted in preparation for the storm. Archer Daniels Midland closed four elevators in New Orleans, while Cargill said elevators in Westwego and Reserve, Louisiana, will be closed. "We have activated our hurricane readiness plan and are taking precautions to ensure the safety of our employees and their families, as well as the security of our assets in the New Orleans area," ADM spokeswoman Jackie Anderson said. The Mississippi River is a major channel for the movement of grain produced in the Midwest farm belt to export terminals at the Gulf of Mexico for shipment across the world. "The safety of our employees is the top priority," Cargill told Reuters. In south Florida, winds from Isaac forced cancellations of hundreds of flights in and out of Miami, Fort Lauderdale and other south Florida airports on Sunday. Isaac is also affecting cruises around Florida and the Caribbean, according to Cruise Critic, a website that covers the industry. Cruise lines have kept ships at sea, altered itineraries and delayed departures of upcoming sailings, Cruise Critic reported. Isaac moved into the Gulf of Mexico after spending several days sweeping across the Caribbean. In Haiti, Isaac added to the misery of more than 350,000 survivors of the 2010 earthquake still living in flimsy resettlement camps as water gushed into tents and corrugated plastic shacks were ripped apart by the wind. Authorities in the impoverished nation said the storm had killed eight people, including three children. In the Dominican Republic, officials said three people were missing, and confirmed the death of the mayor of a town near Santo Domingo, who was swept away as he tried to save another person from a flooded river. No deaths or injuries were reported in Cuba, which got off lightly when the storm crossed its eastern flank instead of raking up the length of the island as originally predicted. Weather.com, Reuters and The Associated Press contributed to this report.